Dual Olympic gold medal-winning cyclist Victoria Pendleton looks set to take part in the Cambridge University United Hunts Club Point-To-Point at Cottenham, near Cambridge, on Sunday November 29th. Just nine months after having her initial riding lesson, the 35-year-old will be jumping a steeplechase fence for the first time in public if she partners Minella Theatre in the race that kicks off the 2015-16 Point-To-Point season, the PPORA Club Members Race, which comes under orders at noon. Minella Theatre is one of 87 horses entered in a six-race fixture which concludes at 2.55pm with a two and a half mile Young Horse Maiden Race. Sponsored by the betting exchange, Betfair, 35-year-old Pendleton has been enticed out of retirement to attempt an audacious ‘Switching Saddles’ challenge with the aim of transforming from a complete novice to riding at the world’s most prestigious jumps racing fixture – the Cheltenham Festival – in March 2016. Britain’s most successful female Olympian with two golds medals and one silver, since hanging up her lycra body suit after London 2012 Pendleton is best known for competing in that year’s Strictly Come Dancing, in which she finished eighth. She has been taking this challenge incredibly seriously, receiving initial riding tuition from one of the country’s top instructors, British Eventing’s National Coach, Yogi Breisner, and also getting guidance from the champion racehorse trainer, Paul Nicholls. Pendleton was beaten into second in a photo finish on her first ride in an official race, on the flat at Ripon on August 31st. She has had two more unsuccessful flat rides since then but is now diverting her attention to the more difficult – and highly dangerous – discipline of point-to-pointing (amateur steeplechasing). She will compete throughout the upcoming Point-To-Point season on two Betfair-owned horses, According To Sarah and Sedgemoor Express, both trained, like Minella Theatre, by the Oxfordshire-based handler, Alan Hill. “I’ve always loved animals and being around horses. Horses are beautiful, majestic and magical, I’m in awe of them and I don’t know how anyone could not be drawn in by them,” said Victoria. “As a girl I begged my father at Christmas for a pony but my Mum and Dad said ‘no way, have a bike instead, you won’t have to muck it out and it hasn’t got a brain so you’ve got half a chance of controlling it. “Cycling was my inevitable destination as I am from a family of cyclists, but it was not something that I chose to do. This is different, it’s the most fun that I have ever had, it really is, and lots of people are saying that they have never seen me look so happy. 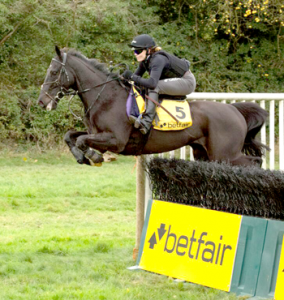 “When Betfair first proposed the Switching Saddles challenge I felt that the stars were aligning – just imagine if I had felt the same passion for cycling that I currently have for riding horses! “This is a ridiculous, audacious challenge. The biggest part of it is that I have gone from a complete novice, I’ve started from the very, very bottom and I only had my first riding lesson on February 22nd. I have to be realistic, I know that all the best things take time, perseverance and dedication, it’s not going to happen overnight. “Hopefully one day I might be a decent rider, but if I don’t qualify for Cheltenham this year it won’t stop me from trying and I won’t stop riding. The RSPCA is appealing for information about a piebald horse that was found tethered with chains and abandoned in a field in Grays, Essex. The pony was suffering with a large wound to her neck that was infested with maggots. The mare was found by RSPCA inspector Marie Hammertoe on 12th November near Courtney Road, after a member of the public called the charity’s cruelty line. Inspector Hammerton said: “This poor pony has a nasty wound on the top of her neck where the tether has been digging in for some time. The tether used was totally inappropriate – a thick metal chain wrapped in what appears to be the inner tube of a push bike. The mare is not microchipped and it appears nobody has been tending to her for some time. She is 12.2hh and is estimated to be around four years old. Anyone with any information regarding this issue can contact inspector Hammerton on the inspector appeal line by calling 0300 123 8018. An exciting new Championship has been given the green light to run at Horse of the Year Show (HOYS) 2016, which will take place at Birmingham’s NEC from 5th – 9th October. The Junior Mountain and Moorland Ridden Pony of the Year Championship opens up another chance for young riders to compete at “The World’s Most Famous Horse Show”. After a detailed review of this and previous years’ finals it is clear that many of the small breed M&M classes are dominated by senior adult competitors which is potentially stifling young riders from progressing. With this in mind and conscious of providing new opportunities to young future stars, HOYS will be introducing this Championship in addition to the current M&M classes. The Junior Mountain and Moorland Ridden Pony of the Year Championship, will provide an exciting platform for junior riders, fresh out of the Mountain & Moorland First Ridden class, to compete on Small Breed Mountain & Moorland ponies, whose breeding is either Welsh Section A, Welsh Section B, Dartmoor, Exmoor or Shetland. All eyes will be on the qualifiers during the 2016 season, as hundreds of combinations begin to benefit from this new opportunity and previously unseen talent starts to emerge. The exciting addition not only supports quality Mountain and Moorland breeds, but also successful young riders of the future. Under the class guidelines, eligible ponies cannot be part bred or exceed the height limits as stipulated by the relevant breed societies. Riders must have attained their 10th birthday by the day of the competition, but must not have attained their 14th birthday before the 1st January in the current year. To preserve the M&M First Ridden Pony of the Year pony/rider combinations may compete in both the M&M First Ridden and the Junior M&M Ridden qualifiers, however should qualification be achieved in both classes the rider must nominate which class they wish to enter at Horse of the Year Show. In this event, the qualification place of the pony will remain and an alternative rider for Horse of the Year Show may be nominated at the point of entering the pony. Class rules and guidelines will be posted on the HOYS website in January 2016 with the announcement of where competitors can look to qualify for this new Championship. William continues to make really good progress from the head injury he suffered following a fall at Lion D’Angers on 17th October. As a result he flew back to England yesterday and his rehabilitation will now continue here. The family continue to ask for privacy as William recovers, and as a result official updates will be issued via the Fox-Pitt Eventing website periodically. William continues to make steady progress, and his recovery is going to take time. He remains in hospital in France. Once again the family are hugely grateful to the team who are looking after him, and also to everyone who has sent messages of support. William’s condition has improved enough for him to be moved out of the intensive care unit, he remains in hospital in France. His family remain hugely grateful to the fantastic team looking after him and to everyone for all the messages and support. This update follows the news on Saturday 17th October that William and his horse Reinstated fell during the cross country phase of the 2015 World Championships for Young Horses in Le Lion d’Angers, France. 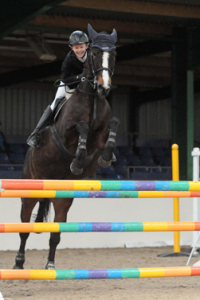 Thirteen year-old Anja Moret from Chelmsford, Essex scooped the victory in the penultimate Dodson & Horrell 1.05m National Amateur second round hosted at Brook Farm Training Centre in Romford, Essex recently. Thirty-one hopefuls came forward with the aim of picking up a qualification ticket for the Dodson & Horrell National Amateur Championships which will run next month at Aintree Equestrian Centre in Liverpool (18th – 22nd November). Following the first round of this class, eight combinations then went on to jump off against each other. With six double clears being produced, competitors kept their eyes on the clock to see who would pick up the top placings. The win in this second round was taken by Anja after she produced the quickest double clear of this second round with Teza Englefield’s 8 year-old bay mare Gypsy Chip. The pairing clocked their double clear in 34.21 seconds. Tagatha Payne, from Welwyn, Hertfordshire finished in second on her own 10 year-old dark bay mare The Maharanee. Two foot perfect rounds from this combination saw them return home with their double clear in 34.55 seconds. Third place went to Luke Humphrey, from Wisbech, Cambridgeshire and he competed with his own 11 year-old bay mare Quinta De La Cense. This combination produced their second foot perfect round in 36.25 seconds.